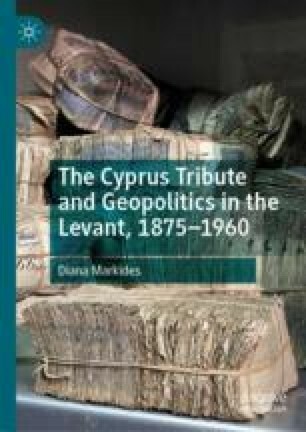 Cyprus emerged relatively unscathed from the regional turbulence in the early decades of the twentieth century. The Levant as a whole underwent seismic changes as nationalism corroded the old loyalties and institutions that held the Ottoman Empire together leading on to regional strife, and eventually world war. Although Cyprus changed status, being annexed by Britain during the First World War, there was no substantial change in the way it was governed. After November 1914, as a British dependency, it was protected from the bloodshed and expulsions that had been the lot of so many populations in the region. This chapter will explore these developments and their lesser, or greater impact on Cyprus, through the prism of the tribute issue. Both religious communities on the island would be most immediately aware of and reacting to the fluctuating nature of Greek irredentist politics at the beginning of the twentieth century, particularly as they evolved on the neighbouring island of Crete. The Muslim Cypriots looked upon developments in Crete with increasing alarm, later magnified by the Italian occupation of the Dodecanese in 1912, the retreat of Turkey from the Balkans and finally the collapse of the Ottoman Empire, brought about by the subsequent world war.